The new owners and managers of the Brandywine Ace Hardware Pet & Feed. From left, owner Chris Drennen, manager Ed Mallard, owner Larry Drennen Sr., manager Casey Kampf and owner Larry Drennen, Jr. show off the new sign, signalling the joining of the former Unionville Feed and & Pet and the Brandywine Ace. POCOPSON — It’s kind of a no-lose scenario for local shoppers. If you’ve always shopped at the Brandywine Ace, you’ll find an increasing number of products, especially when it comes to feed and pet supplies — plus, in the coming months, more space and a whole new look. If you’ve been a loyal customer of Unionville Feed & Pet, you’ll have to drive a bit further, but the Drennen Family — the owners of the new Brandywine Ace Hardware Pet & Farm — are willing to make it worth your while, knocking 5% off your purchase for the next few weeks. Plus, you get easier parking and much better selection. 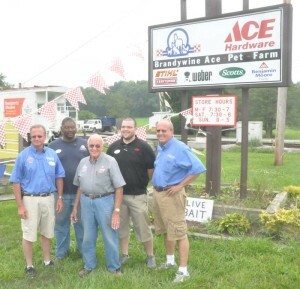 The biggest issue owners Larry Sr., Larry Jr. and Chris Drennen said Thursday with the move was confusion, rumors about what was going on and some worried local customers — worried that their beloved store, either the old Brandywine Ace or the old Unionville Pet Feed would close. The truth is this: customers of both stores are likely to enjoy a better shopping experience in the near term, but more so, once the current retail space is expanded. The result is going to be more like the Drennen’s other outlet, Oxford Feed and Lumber. The Drennens had been looking for another option — initially hoping to stay in the Unionville/Willowdale area — but couldn’t find a way to make it work, despite looking closely at a number of locations. Although full of praise for East Marlborough township officials — they make it clear that the township worked with them to keep the store in town, there just wasn’t a great fit. Without room to grow — and expand their product line — the Drennens said they worried about frustrating their customers by not having he items they needed. It was at about that point that the owners of the Brandywine Ace building — as well as the group renting it and running the Ace franchise — were looking to move on. With that sort of opportunity — and facility — available, as much as the Drennens wanted to stay in Unionville, the Pocopson site was just too good to pass up. An artist’s rendering what the new Brandywine Ace Hardware Pet & Feed will look like after renovations, scheduled for later this year. The new store is already showing signs — literally — of the transition. First, there’s the new sign. Inside the store, the product mix is already being reworked — all the hardware always available at the Ace is still there, but now there’s a wide range of supplies for horses, cattle and other farm needs. Expect to see a wider range of gift and leisure products, too. One thing that hasn’t changed: the great employees from both outlets. All of the Unionville Feed & Pet employees and joining the Brandywine Ace team, and all of the current employees at Brandywine are being kept on as well. And there was never a doubt that the Drennens would continue their relationship with Ace Hardware — the store’s customers have one of the highest rates of using the Ace Rewards card in the nation, plus Ace has been a strong marketer in recent years. In the coming months, pending some township approval, customers will see even more improvements, as the rear office space is renovated into retail space. About the only thing that won’t be carrying over is the old lawn mower/tractor sales and service operation — which had already closed before the transition. The store will continue to sell and service its full line of Stihl power equipment. In addition to a whole new exterior look, the store will add a second entrance along Pocopson Road. With the bigger interior — hopefully by this fall, pending approvals by the township — the plan is to offer new items, including clothing and an expanded gift area. I’ve been a Unuonville customer for years. Yesterday was my first time into Ace. I found everything I was looking for, the service was great, and I enjoyed my 5% off! Artist rendering looks fabulous. Great Article! We love Ed and the Unionville crew!